Daniel, J. M., Deuchars, J. and Deuchars, S. A. (2016). Organotypic Spinal Cord Slice Cultures and a Method to Detect Cell Proliferation in These Slices . Bio-protocol 6(19): e1951. DOI: 10.21769/BioProtoc.1951. In these culture models, the normal cytoarchitecture and local neuronal circuits of the spinal cord are preserved, offering a compromise between dissociated cell cultures and complete animal studies. The addition of 5-ethynyl-2’-deoxyuridine (EdU) to the culture medium allows for the detection of proliferating cells. Note: This link leads to a range of Petri dishes. Autoclave dissection equipment, filter paper and tips for Gilson pipettes. Prepare dissection medium and culture medium in a laminar flow hood. Pre-acclimatise culture medium to 37 °C in incubator. Swab the tissue chopper with 70% ethanol and secure a fresh razor blade in place, which has been wiped first with acetone to remove any grease and then swabbed with 70% ethanol. Make up fresh sucrose artificial cerebrospinal fluid. Terminally anaesthetise mouse, aged between 8-20 days by an intraperitoneal injection of sodium pentobarbital (60 mg/kg). When all pedal withdrawal reflexes have ceased and there is no response to a strong pinch of the hind limb, nor a corneal reflex, the animal is considered to be sufficiently anaesthetised for the procedure. Open the chest up and cut away the rib cage to expose the heart. A trans-cardiac perfusion is then performed through the left ventricle with 25 ml of ice cold sucrose artificial cerebrospinal fluid to enhance viability of slices. This is illustrated by Gage et al. (2012). Note: This procedure is carried out using fixative and for this protocol, sucrose artificial cerebrospinal fluid is administered via a syringe – a pump system is not required. Remove the dorsal skin and perform a dorsal laminectomy to expose the spinal cord. 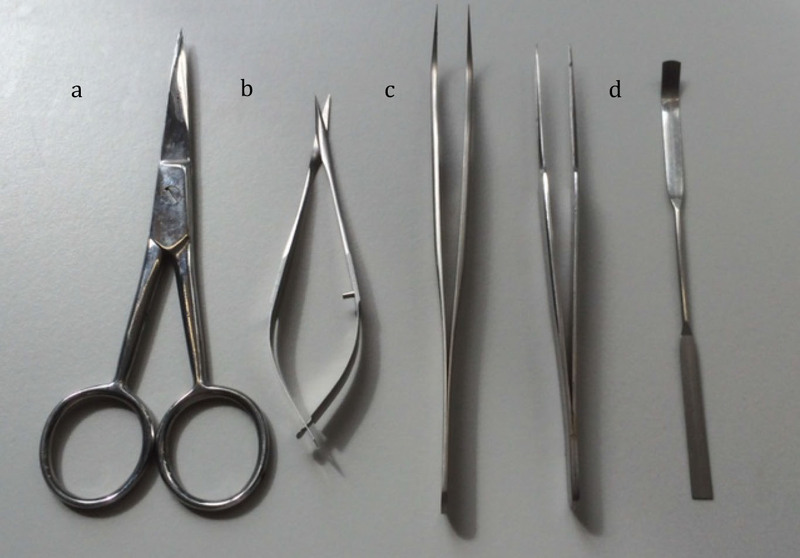 Remove the spinal cord using fine spring scissors and fine forceps and place in a 50 mm Petri dish containing ice cold dissection medium (Figure 2). This is procedure is illustrated in a video taken from Gunther et al. (2012). Note: In this example the procedure is carried on fixed tissue. For organotypic slice cultures the spinal cord must not be placed in paraformaldehyde solution after it has been dissected free but in cold dissection medium. Remove the meninges (pia, arachnoid and dura mater) under a dissecting microscope, using fine forceps. Select the mid-lower thoracic/upper lumbar region of the spinal cord (approximately T8-L2; Figure 3). Figure 3. Removing the meninges from the spinal cord. A. A diagram displaying the meninges (taken from Medical Dictionary, accessed May 2016); B. An image depicting removal of the meninges; C. A diagram displaying the region selected for culture. Transfer the selected region of spinal cord, using a microspatula, onto a sterile filter paper moistened with dissection medium that is situated on the plate of the tissue chopper and cut 300 µm transverse slices. Transfer the slices, using a microspatula, to a Petri dish containing ice cold dissection medium, this will remove any excitotoxic chemicals and debris. Under a dissection microscope using fine forceps and a microspatula, separate the slices and discard any damaged slices. Note: All procedures from this point onwards are performed in a laminar flow hood. Pipette 1 ml of pre-acclimatised culture medium into each well of a sterile 6-well culture plate and, using sterile forceps, place a millicell organotypic filter insert on top of the culture medium. Immediately following this, using a Gilson P1000 pipette with a sterile tip that has had the end cut off to widen the diameter (thus limiting damage to the slices), transfer 2 to 6 slices onto each filter. Care must be taken that the slices are not touching each other or the side of the filter. Remove all excess medium from around the slice by means of a Gilson pipette with sterile tip; ensure there is no medium above the filter (Figure 4). Transfer culture plate to the incubator, where slices are maintained at 37 °C under standard conditions; 100% humidity, 95% air, 5% CO2 enriched environment. After 24 h in culture, using sterile forceps to lift the organotypic filter insert carefully out of the well, remove culture medium using Gilson P1000 pipette with a sterile tip and replace the culture medium with 1 ml of serum-free medium using Gilson P1000 pipette with a sterile tip. Carefully place filter back onto the fresh medium, ensuring that there are no air bubbles under the filter. The serum is required initially, as it aids the slices in recovery from the trauma of explantation. The key advantage of changing to serum free medium is that the exact constituents can be determined. Serum may also contain substances that influence the growth of a particular population of cells and may promote microglial proliferation (Coltman and Ide, 1996). For the remaining time in culture, remove half the medium (0.5 ml) and replace with 0.5 ml of fresh serum free medium, every second day. This technique leaves some of the natural growth factors, which assists in maintaining good viability in the cultured slices. The cultured slices maintain good morphology (Figure 5). After 48 h in culture, add 1 µl of EdU (1 mM) directly to the 1 ml of medium in each well. 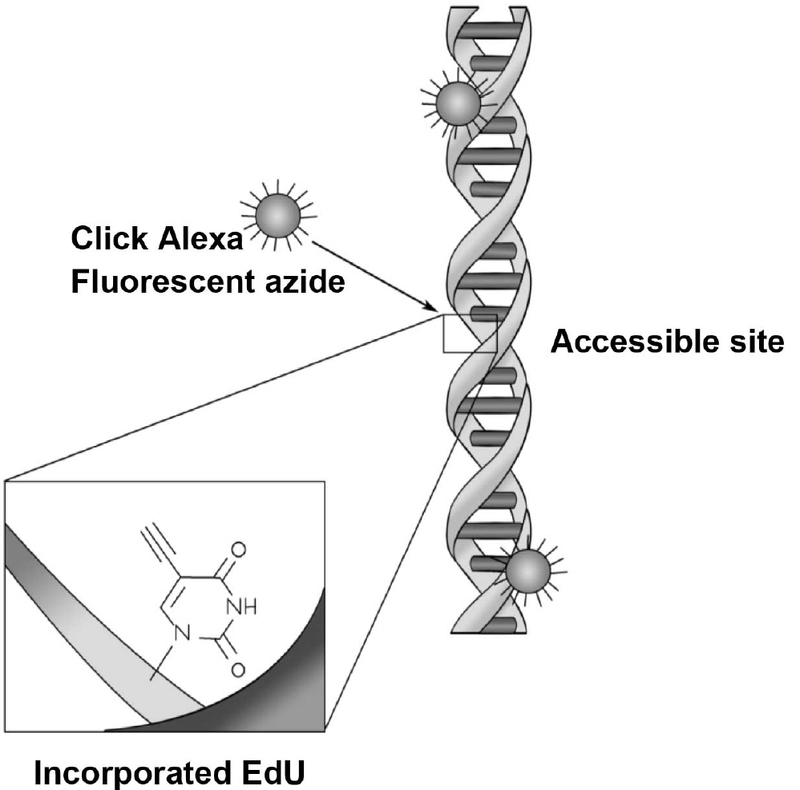 Add fresh EdU (0.5 µl) following any subsequent medium changes. EdU is a thymidine analogue that is incorporated into DNA during active synthesis in the S-phase of the cell cycle (Figure 6) (Chehrehasa et al., 2009) providing a fast and reproducible method to employ for the study of cell proliferation (Figure 7). Note: This stage can be omitted if you do not wish to investigate cell proliferation. Figure 7. Timeline for culturing slices. Schematic of the timing for culturing slices and addition of EdU. 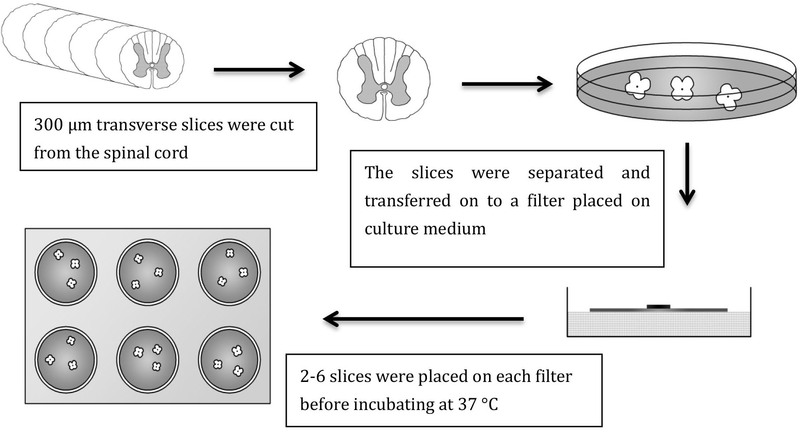 After the allotted time in culture, fix the slices by removing the filter from the 6-well culture plate, with slices in situ and place on top of 1 ml of 4% paraformaldehyde in 0.1 M phosphate buffer in a new 6-well culture plate. Carefully apply a further 500 µl of the 4% paraformaldehyde solution on top of the filter, covering the slices completely. Leave slices in fixative for 6 h at 4 °C. Using a fine paint brush, carefully ease the slice free from the filter and place individually in 500 µl 0.1 M phosphate buffered saline in a 24-well histology tray. Note: Slices can be stored at 4 °C in phosphate buffered saline for up to 7 days at this point. Slices are kept in the 24-well histology tray throughout and this technique of free floating the slices is continued during the procedure. Each solution is removed from the well carefully at the end of allotted time using a pipette and the next solution carefully added by allowing it to run down the side of the well and not directly on top of the delicate slices. Unless otherwise stated, all steps are carried out at room temperature, with gentle agitation of the sections on a shaker plate. Incubate in 500 µl PBS with 0.2 % Triton for 12 min. Wash 2 x 10 min in 500 µl 0.1 M Tris buffer. Incubate slices in a mix of 320 µl distilled water, 25 µl Tris buffer (2 M), 50 µl copper sulphate (10 mM), 5 µl biotinylated azide (1 mM) and 100 µl ascorbic acid (0.5 M) in each well (make up fresh each time) for 30 min. Wash 1 x 10 min in 500 µl PBS. Incubate in Streptavidin Alexa555 1:1,000 in 500 µl PBS with 0.1 % Triton for 1 h, protect from light by wrapping histology tray in tin foil for this and any subsequent steps. Wash 3 x 10 min in 500 µl PBS. The sections can then be immunohistochemically labelled with appropriate antibodies following instructions of the supplier at this stage before mounting (Figure 8). Note: The slices are not agitated for longer than 2 h in the primary antibodies, as they start to disintegrate. If longer incubation time is required, leave in the histology tray without agitation at 4 °C. Free float the slices in a Petri dish of distilled water and carefully float the slice onto a glass slide and guide into position with a fine paint brush. Protect from light and allow to air dry. Mount using VectaShield mounting media with or without DAPI (4’,6-diamidino-2-phenylindole). Apply glass coverslip and seal with nail lacquer. Following detection of EdU, these slices were also immunohistochemically labelled with anti-PKD2L-1 (polycystic kidney disease 2-like 1 protein) labelling cerebrospinal contacting neurones. 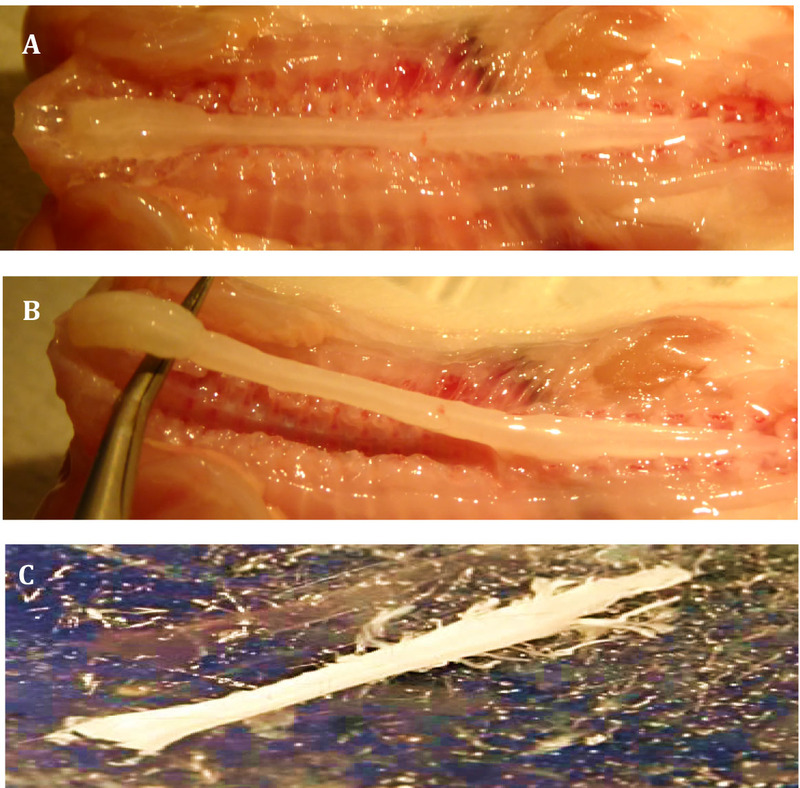 Minimising the time taken for the spinal cord to be removed from the animal and established in culture is imperative to achieving good viability in the slices. Therefore the preparation must be carried out as efficiently as possible, while still ensuring there is no damage to the spinal cord. Dissolve 10 PBS tablets in 1 L distilled water (pH 7.4). Dissolve 9.35 g NaH2PO4·2H2O in 300 ml distilled water. Dissolve 33.85 g Na2HPO4 in 1,200 ml distilled water. Add NaH2PO4·2H2O solution to Na2HPO4 solution until pH is 7.4. Note: Adjust to pH 7.6 with a few drops of sodium hydroxide if necessary. Note: Add all ingredients except CaCl2 to the distilled water, shake to dissolve completely then add CaCl2 at the end and shake to disperse. Note: Gentle heat and continual stirring may be needed to help dissolve the paraformaldehyde; this must be carried out in a fume hood. Solution becomes cloudy, so clear with a few drops of 1 M sodium hydroxide solution, if necessary adjust the pH to 7.2 with a small amount of dilute HCl. This procedure known as the interface method was modified for spinal cord culture from the original method of Stoppini et al. (1991). Chehrehasa, F., Meedeniya, A. C., Dwyer, P., Abrahamsen, G. and Mackay-Sim, A. (2009). EdU, a new thymidine analogue for labelling proliferating cells in the nervous system. J Neurosci Methods 177(1): 122-130. Coltman, B. W. and Ide, C. F. (1996). 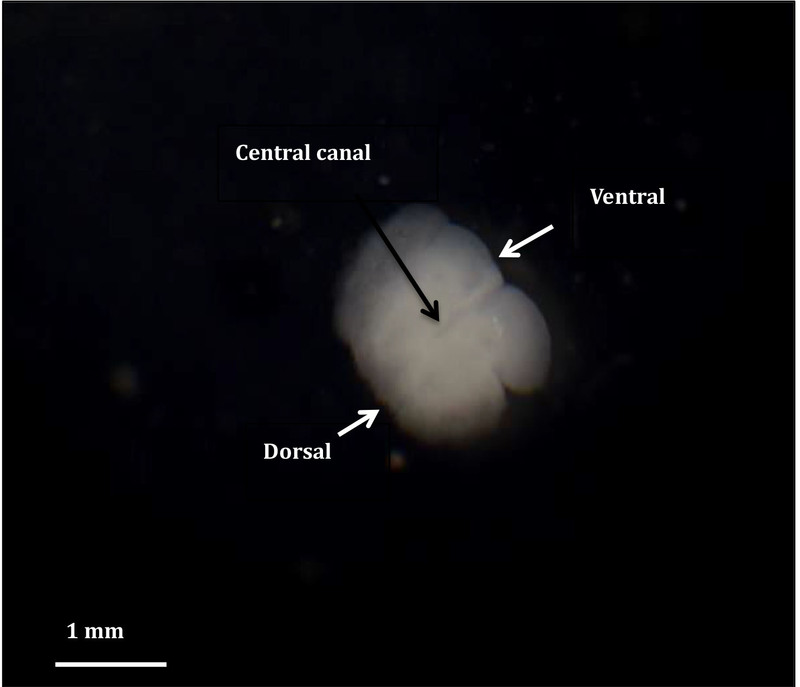 Temporal characterization of microglia, IL-1β-like immunoreactivity and astrocytes in the dentate gyrus of hippocampal organotypic slice cultures. Int J Dev Neurosci 14(6): 707-719. Gage, G. J., Kipke, D. R. and Shain, W. (2012). Whole animal perfusion fixation for rodents. J Vis Exp(65). Gunther, R., Suhr, M., Koch, J. C., Bahr, M., Lingor, P. and Tonges, L. (2012). Clinical testing and spinal cord removal in a mouse model for amyotrophic lateral sclerosis (ALS). J Vis Exp(61). How to cite: Daniel, J. M., Deuchars, J. and Deuchars, S. A. (2016). Organotypic Spinal Cord Slice Cultures and a Method to Detect Cell Proliferation in These Slices . Bio-protocol 6(19): e1951. DOI: 10.21769/BioProtoc.1951. Slice did not stick to membrane ? Sorry to hear you have had trouble with the slices not adhering to the membrane. The most likely reason for this is that all the media has not been removed after transferring the slices on to the membrane. Other occasion when I have trouble with the slices adhering to the filter is when the tissue is not viable, may be due to it taking a bit to long to complete the prep or bacterial contamination.